We’d love your help. Let us know what’s wrong with this preview of The Story Collector by Kristin O'Donnell Tubb. Eleven-year-old Viviani Fedeler has spent her whole life in the New York Public Library. She knows every room by heart, except the ones her father keeps locked. When Viviani becomes convinced that th In the tradition of E. L. Konisburg, this middle-grade mystery adventure is inspired by the real life of Viviani Joffre Fedeler, born and raised in the New York Public Library. To ask other readers questions about The Story Collector, please sign up. Judy I would use it for grades 4-6. From 2007 until about 2012 I had the distinct pleasure of working in the Stephen A. Schwarzman Building of New York Public Library. It’s one of those parts of my working life I look back at with a little bit of amazement. For only one time in my life I could essentially say to someone, “You know that library with the big stone lions in front in New York City? Yeah. I work there.” Initially I worked in the Children’s Center at 42nd Street where I held Literary Salons, worked alongside the origina From 2007 until about 2012 I had the distinct pleasure of working in the Stephen A. Schwarzman Building of New York Public Library. It’s one of those parts of my working life I look back at with a little bit of amazement. For only one time in my life I could essentially say to someone, “You know that library with the big stone lions in front in New York City? Yeah. I work there.” Initially I worked in the Children’s Center at 42nd Street where I held Literary Salons, worked alongside the original Winnie-the-Pooh stuffed animals, and conducted tours of the whole building. Well… not the WHOLE building. There are places down in the deep stacks below the building where no one really goes, and you can bet that some colleagues and I took the time to explore them thoroughly over the years. Later I would work in the building in my new capacity as the Youth Materials Specialist, and it was then that I started visiting library branches all over the city, only to encounter again and again the abandoned library apartments they housed. These were full working apartments housed within the libraries that used to belong to the maintenance workers of the library system, now no longer in use. After a while, I began researching them more thoroughly, looking into their residents, how long they were operational, and the stories associated with them. One such apartment, located on the Mezzanine level of the main location, housed a whole family of kids. You can read news articles from the Times about how they’d play baseball in some of the rooms, raise pigeons on the roof, and how their father would try to scare them with stories of a red bearded ghost. Now all that rich fodder has been turned into a middle grade novel, made under the auspices of New York Public Library’s new imprint with Henry Holt & Company. And happily, it is not only a rip-roaring tale of mystery and ghostly possibilities, but also one filled with a lot of fun and true facts about the time. Got a kid who wishes they could live in the library? Reading this book is the next best thing. Ever wanted to live in a library? Imagine that you did. It's the 1920s, Viviani’s spent her whole life surrounded by the gilt and marble of the main location of New York Public Library with her siblings, and life is pretty sweet. She spends her time dodging the creepy janitor Mr. Green and trying to spot the ghost, Red, that her father told her about. Then she meets a new girl at school who doesn’t believe her wild and outrageous stories or even that she lives in a library! Worse, an expensive stamp collection on display has been stolen and no one has a clue where it went. It’s up to Viviani, her new frenemy Merit, and her friends and sibs to uncover the multiple mysteries hidden behind the library shelves. It is one thing to write a mystery for kids, but it is another thing entirely to play fair when you do. Now I love The Westing Game, don’t get me wrong. That book has more going for it than a pack of Agatha Christies, but don’t ever sell me on it being a tried and true mystery novel. To my mind, a real mystery novel gives a kid the chance to solve it on their own. Not in some Encyclopedia Brown way where they use their knowledge of trivia to solve the case, but where they pay careful close attention to what the author's laying down and put the clues together. A mystery author, therefore, must walk a fine line. On the one hand they need to place the clues throughout the text. On the other hand, they can’t make them too easy. If you give too much of the game away, it’s going to be a problem. In The Story Collector I am happy to report that Ms. Tubb does an excellent job of this. As an adult I could pretty much figure out the villain of the piece. That means that a couple sharp-eyed young readers will do the same, while others are completely flummoxed by the reveal. In other words, it hits the mystery sweet spot. As for the book itself, it’s definitely going for that sweet spot of living in a public building (ala The Mixed-Up Files of Mrs. Basil E. Frankweiler, which many a recommendation blurb has cited) with the Nancy Drew-ish vibe of a spunky young woman solving a mystery with a slight supernatural bent. Now Tubb is no stranger to conjuring up strong characters and plots. She’s one of those middle grade authors that makes it look effortless. What’s important in this particular case is that she also needed the idea of living in a library to sound like fun. I know that sounds ridiculous at the outset, but when an author comes up with a cool premise it can be difficult to hold onto that kernel of cool (cool = living in a library) when you have to wrangle character arcs and development, a mystery, and a sense of time and place. Ms. Tubb juggles all with such ease, it’s enough to give a gal envy. The trouble with working for the New York Public Library and then handling a book of this sort that is that there is too much information in my brain. As I watched Viviani navigate the lower levels of the main location, I was consciously aware that my position is odd. Almost nobody else is going to know where the door to the lower levels is precisely located, after all. Once I was able to compartmentalize that information, I could really settle down to enjoy the book. I read an early galley of this book prior to publication, and to my delight several mistakes that I found in that book were corrected for the final publication. Clearly somebody somewhere was copy editing this thing incredibly well. Bravo, faithful fact-checkers! The last library apartment in the NYPL system didn’t fall out of commission until the turn of the new Millennium. Even before that happened, though, many of the apartments fell into disrepair because they aren’t ADA compliant (and many are potential fire hazards). Viviani’s home on the Mezzanine of the Schwarzman Building is all office space and currently houses whole rows of cubicles, albeit cubicles with killer half-moon windows that look out upon the city. The era of the library child may have passed but with books like this one it’s possible that the romance of their lives may only be beginning. A mystery that plays fair with its tropes and gives as good as it gets. Here’s to many more future books about kids living in libraries. Eleven-year-old Viviani Joffre Fedeler is a story collector and story teller. How could she be anything else, having been born and raised in the New York Public Library? She was born just three days before the library's grand opening, just after her father was hired as building Superintendent and moved in with the family. Viviani knows every inch of the library -except the off-limits places like her father's workshop. She longs to explore more and finally come up with her own story-a story about Eleven-year-old Viviani Joffre Fedeler is a story collector and story teller. How could she be anything else, having been born and raised in the New York Public Library? She was born just three days before the library's grand opening, just after her father was hired as building Superintendent and moved in with the family. Viviani knows every inch of the library -except the off-limits places like her father's workshop. She longs to explore more and finally come up with her own story-a story about who she is. When a new girl at school, Merit, questions the truth of some of Viviani's stories, Viviani is devastated. She decides to teach Merit a lesson in the power of stories by inviting her to the library to see the library ghost! Viviani, her brothers and friends get more than they bargained for and learn a valuable lesson about stories. I really liked this idea of this story. Like From the Mixed-Up Files of Mrs. Basil E. Frankweiler kids spend the night in a New York institution-this time the New York Public Library of 1928. The New York Public Library is an amazing place and I loved getting an insider's tour of the iconic building. If I could spend the night at the library I wouldn't waste time sliding down banisters- I'd read! I'd love to go back to 1928 and get my hands on a first edition The House at Pooh Corner or if I was locked in now I'd camp out with Pooh and friends. The 1928 library is something of a spooky place so I can see where the ghost stories evolve from and I probably would have believed them and been scared too when I was Viviani's age. The plot was fun but it was WAY to obvious who the villain was and how they managed to steal something valuable from the library. I would have liked more suspects and less transparency. Viviani "Red" is not the most appealing character. I didn't like how Viviani spends her time roaming around the library. Today I think she would be labeled ADHD! She can't seem to settle on any one subject to study or any one game to play. She spends her nights running around the library, sliding down banisters and causing mischief and mayhem wherever she goes. Yet, she's very sheltered and naive growing up in the library. She doesn't know much about the outside world yet and believes what she hears. I did relate to Viviani's desire to find her own once upon a time, however, and how much she believes in the power of storytelling and imagination. I liked the rest of the family better. Mr. Fedeler is warm and funny. He understands his children, allows them to have a degree of freedom but wants them to be safe. I love his way of teaching the children important lessons and punishing them. Mrs. Fedeler is a little more tough but she handles her lively children with good humor. Viviani's older brother Oliver is the naughty one. He is at the age where he tests boundaries. He likes to read and learn but seems to prefer a more active lifestyle than his younger brother Edouard. 12-year-old Edouard is the nerdy one of the family. He likes facts and memorizing new bits of information to share at the appropriate moment. I could relate to him the most of the children! *Thanks to the author, Kristin O'Donnell Tubb, for the free copy of this magical tale. All opinions are my own. Gather around, my friends, and you will hear a fantastic story seemingly too impossible to be true. A family living in apartments in THE NYPL? A baby born among the books, her first cries ricocheting off of the shelves? The family's children playing baseball, complete with the newly-published Winnie the Pooh, as a base, in the library? A valuable stamp collection displayed in said libra *Thanks to the author, Kristin O'Donnell Tubb, for the free copy of this magical tale. All opinions are my own. Gather around, my friends, and you will hear a fantastic story seemingly too impossible to be true. A family living in apartments in THE NYPL? A baby born among the books, her first cries ricocheting off of the shelves? The family's children playing baseball, complete with the newly-published Winnie the Pooh, as a base, in the library? A valuable stamp collection displayed in said library, stolen in the night? Yup. It all happened. But the extra twists of an author's babbling imagination only add to the plot of this historical fiction/mystery. The red herring? Check. The girl-friendship drama? Mmmhmm. The tone pitch perfect to its era? Yes. As a matter of fact, I was thrilled to see that THE Betsy Bird also saw a Nancy Drew-ish quality on the pages in her own review. Kudos to author Kristin O'Donnell Tubb for the meticulous research; her work is peppered throughout the book and will undoubtedly make curious readers (like me) run for Google to find out more about the historical references. The clever chapter headings-Dewey Decimal subheadings-give an air of whimsy. The author's note detailing the fact from the fiction in the book. The time line. The peek into the library's archives. What a rich resource, a love letter to the art of reading and writing and library science, a nod to an iconic institution. And who can resist the playful way in which the opening unfolds: "Some people are story collectors. While others collect seashells, or stuffed animals, or stamps, story collectors wrap themselves in words, surround themselves with sentences, and play with participles, even those pesky perky dangling ones. They climb over Cs and mount Ms and lounge in Ls. Soon enough they land in the land of homonyms, then, wham! They stumble into onomatopoeia, that lovely creaking, booming bit of wordplay-and hat, Dear Friend, is where our story begins." ,,,or that ending?! Oh, my. My students will LOVE the ending. That one sentence at the end! Delightful. Quite simply, The Story Collector is the bee's knees. "That powerful cry of yours echoed and absorbed into the thousands of books lining the shelves. And in return, those books awakened, unfurling their words, their worlds, slowly, quietly, until stories became as much a part of you as your red hair, your green eyes." ..."courage is simply fear stuffed with hope." "Without imagination, nothing is dangerous." "Sometimes a glimpse of sunshine makes itself known through the murky leaves and limbs of the dark forest. Sometimes a glimmer of friendship can be found in places where only animosity was seen before." "Every story is true underneath it all." "'Look at all this stuff I don't know yet.' Viviani smiled at the yet. part. Her father always said bold learners think in terms of yet." "Sometimes the bad guy is disguised as a good guy. Does that mean...that sometimes the good guy looks like a bad guy?" "...this fellow had helped her realize that her story was worth telling. That her voice was worth listening to. That she was, indeed, a story collector." "Viviani smiled and considered all the stories Mr. Green would be able to unlock with this key. This special, one-of-a-kind key: the unique mix of books and stories that he would choose to read. Different from everyone else on the planet. His blanks to fill in. His Once Upon a Time." Is there anything more amazing than visiting your local library? How about living in a library? I suppose that not every kid has a fantasy to live in a library 24/7, but I sure did. I couldn't of course, I came as close as I could. Throughout my school days, I spent as much time in the campus libraries as I could. I was in city libraries daily during breaks and as an adult, I am delighted that my child walks to his local branch near daily (mostly to get books for me) and jumps at the chance to Is there anything more amazing than visiting your local library? How about living in a library? I suppose that not every kid has a fantasy to live in a library 24/7, but I sure did. I couldn't of course, I came as close as I could. Throughout my school days, I spent as much time in the campus libraries as I could. I was in city libraries daily during breaks and as an adult, I am delighted that my child walks to his local branch near daily (mostly to get books for me) and jumps at the chance to visit the main branch every chance he gets. As I read the antics that Viviana and her tribe get up to in The Story Collector, I could see a group of kids just like them getting into that kind of mischief at our wonderful library. Amazing as our library is, it pales next to the New York Public Library, the true star of this book, brought to life beautifully by the author. It was so easy to envision it in its prime when strict librarians and card catalogs ruled with an iron grip. This book was a true adventure. An adventure is what Viviana is desperate for, just like the ones she reads in the books all around her. Her father is the building super at the New York City Library, during the 1920’s, so she and her family actually live in the library, all those stories at her fingertips and the whole of the building is a playground for her and her siblings, as long as they can avoid disturbing the librarians, evade the security guard, and keep clear of the janitor, who may or may not be a cannibal. Oh yeah, they also have to keep away from Big Red, the ghost that haunts the library. While she is waiting to find adventure, she collects stories and shares them her friends at school. However, a new student in her class isn’t impressed with Viviana’s stories and an attempt to sway her opinion with an overnight ghost hunt backfires its way into a mystery that only the children may be able to solve. Well written and imaginative, with the perfect touch of mystery, this book is a must-have for middle-grade readers. That it has a basis in actual history makes it all the more fun. Thanks to the publisher for the ARC in exchange for my honest review. Eleven-year-old Viviani Fedeler and her family live in the New York Public Library where her dad is the superintendent. She had her siblings are constantly playing in the stacks and being sushed by the librarians. Not only does Viviani love to read but she also loves to tell stories. That is until new student Merit Mubarak comes to town and calls her a liar. In her quest to prove herself Viviani sets out to trick Merit and ther Thanks to the publisher for the ARC in exchange for my honest review. Eleven-year-old Viviani Fedeler and her family live in the New York Public Library where her dad is the superintendent. She had her siblings are constantly playing in the stacks and being sushed by the librarians. Not only does Viviani love to read but she also loves to tell stories. That is until new student Merit Mubarak comes to town and calls her a liar. In her quest to prove herself Viviani sets out to trick Merit and there are disastrous results. Set in the 1920’s and based on the real Fedeler family I thought this was a great story. I loved the timeline, photos, and authors note at the end. I also loved the chapter titles with their Dewey decimal number and alternate subject headings. This was so beautiful!!! One of my favorites. The writing was so vivid and the details made you feel like you were there. The author did an amazing job with the accuracy of the library, city, and characters (many of them, including the MC, were real). Such a fun read. Several months ago, I spied this story on a list of upcoming 2018 releases and immediately added it to my TBR list. A historical fiction novel about a girl living in the New York Public Library? I was HOOKED. In this story, we have Viviani, a curious, imaginative eleven-year-old who lives in the NYPL with her family, as her father serves as the library superintendent. Viviani loves stories, especially sharing them with her classmates at school and using them to make her best friend, Eva, laugh. Several months ago, I spied this story on a list of upcoming 2018 releases and immediately added it to my TBR list. A historical fiction novel about a girl living in the New York Public Library? I was HOOKED. In this story, we have Viviani, a curious, imaginative eleven-year-old who lives in the NYPL with her family, as her father serves as the library superintendent. Viviani loves stories, especially sharing them with her classmates at school and using them to make her best friend, Eva, laugh. A new girl, Merit, moves to NYC from Egypt, and the two don't get along so well. Merit is very practical, which Viviani's imagination often gets her into mischief. The girls team up, however, after some valuable stamps from a new exhibit go missing from the library. Intriguing! This is a quick, easy read, but an enjoyable one as well. The atmosphere is divine: I've, unfortunately, never visited the NYPL (especially not in the early 1900s! ), but this book's descriptions made me feel like I could've lived there too. For such a short book, there were a lot of facts and historical anecdotes weaved into the story seamlessly. I have so many ideas of how a teacher could implement this novel into a classroom curriculum! The characters were also one of the novel's strong points. Viviani is described by another character as being a, "real life Anne Shirley," and that description was spot-on, from Viviani's wild imagination to her striking red hair. She was fun, precocious, and flawed, and she acted and sounded like her age. One of my biggest pet peeves is authors who try to write younger characters and don't execute it well at all. The characters either sound/act too "old," or their speech is very stunted and inorganic. Tubb did an excellent job making her characters, young and old, sound like they were real people on the page. In middle grade novels, where adults are often supporting characters, I honestly don't notice them much because I'm too focused on the main characters. That being said, I really enjoyed a lot of the adults in this story too! Mr. Fedeler, Viviani's father, and Mr. Green, the mysterious library custodian, were my favorites in particular! "Our stories are what makes us unique." "The combination of stories in our lives-the unique mix of the stories we chose to read, chose to live-makes each of us just a tiny bit different from everyone else on the planet." I could go on, but then I'd quote the book, and that's not exactly legal. Anyway, the quotes were spectacular. I liked how other little stories-personal anecdotes, ghost stories, etc.-were used to teach Viviani certain life lessons. Those stories make complex issues easier for an eleven-year-old, even a smart one, to understand. I think that sends a powerful message to readers as well. Stories are important, even if you're not a huge reader. For a girl who lived in the library, Viviani was rarely described reading, but she loved a good story anyway. How many people do you know that can relate? I really wanted to rate this book five stars, and I thought we'd get there, however, my biggest complaint with this story was that I wish the mystery described in the synopsis came into play a little earlier. It was essentially introduced, planned, and solved in about two chapters, which really didn't do it justice, nor was it logical. This is a spoiler-free review, so I won't go into too much detail, but essentially, Viviani recruits both Eva and Merit to help her catch the thief that stole some valuable stamps from a patron's stamp collection that's being loaned to the NYPL for a special exhibit. There is an excellent plot line, and unfortunately, it wasn't given enough time to be fully fleshed out to really be effective. The Story Collector is an interesting piece of historical fiction as it paints a beautiful picture of what New York City was like in the 1920s. You really do get a fantastic feel of the places that Vivani visits, but primarily the Public Library which serves as her home. As the author's note and timeline in the back of the book points out, a lot of elements of this story are true. Vivani really existed and her father did work as the superintendent of the library. This kernel of truth made the story feel all the more vibrant. It was fun to put myself in Vivani's shoes and see the magic of the library through her eyes. The story also carried a nice message about the importance of stories. As the library was so central to the story, this theme kept very in-keeping. Over the course of the novel, Vivani learns the important difference between telling tall tales and lying. She also learns about how it's not nice to be tricked, particularly by someone that you trust. These are really important lessons to learn and were delivered in a way that did not feel too heavy handed. However, I did not think that the plot of the story was very strong. The actual "mystery" of the plot does not kick in until the last thirty pages of so and does not really offer much of a puzzle for readers to solve. The culprit is made pretty obvious early on and is captured by the children with remarkable ease. Because of this, the book really did lack drama. The rest of the story was devoted towards scene setting and Vivani's animosity towards Merit. The characters in this story were a little varied. While a lot of the characters, such as Vivani's family, did fade into the background a bit, I did rather like how the rivalry between Vivani and Merit was presented. The two female characters were very strong and represented two different schools of thought - creativity and logic. While their friendship took a long time to develop (and Merit's early dismissal of Vivani was really annoying), it was nice to see the two of them become closer in the second half of the story. I love books in which the setting of New York City becomes nearly as central as one of the characters or plot elements. I have so many favorites: picture books, chapter books, adult fiction, kids nonfiction. So The Story Collector was a natural for me. The fact that the specific location in NYC is the New York City Public -- the main branch with the lions out front -- well, how could I resist? I wasn't disappointed. 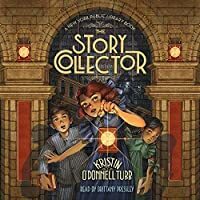 The Story Collector is a light family story with a bit of mystery thrown in, and I love books in which the setting of New York City becomes nearly as central as one of the characters or plot elements. I have so many favorites: picture books, chapter books, adult fiction, kids nonfiction. So The Story Collector was a natural for me. The fact that the specific location in NYC is the New York City Public -- the main branch with the lions out front -- well, how could I resist? I wasn't disappointed. 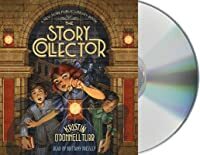 The Story Collector is a light family story with a bit of mystery thrown in, and some friendship conflict included. The characters are well-drawn and distinctive. The author explains historical elements without being didactic or taking away from the plot. The mystery isn't terribly mysterious, but it's not really the main point of the book IMO. I love the homage to books and reading since it's in a new collection of books published in/around/for publicity for the New York Public Library but I was more captivated by the note at the end of the real Viv and her story being *swoon* born in a library and raised for the first 15 years of her life with her family because her dad was the library's superintendent. BUT, the fictionalized story, while adventurous and squarely middle grade with it's silliness, humor, intrigue, and light, did not d I love the homage to books and reading since it's in a new collection of books published in/around/for publicity for the New York Public Library but I was more captivated by the note at the end of the real Viv and her story being *swoon* born in a library and raised for the first 15 years of her life with her family because her dad was the library's superintendent. BUT, the fictionalized story, while adventurous and squarely middle grade with it's silliness, humor, intrigue, and light, did not do anything for me either from the character, setting, or plot perspectives. I didn't really feel much but absolutely enjoyed the illustrations throughout and the thought BEHIND the concept of the stories. A tale for story lovers of all generations to enjoy. I love the author's note at the end explaining the historical significance of this book. I couldn't help being jealous of Viviani being born and raised in the flagship New York Public Library. I love how the main character appreciates stories as part of our identity. I agree that it's the unique mix of stories in our lives that makes us a tiny bit different from everyone else. Stories do help make sense of big feelings and unexplainable thing A tale for story lovers of all generations to enjoy. I love the author's note at the end explaining the historical significance of this book. I couldn't help being jealous of Viviani being born and raised in the flagship New York Public Library. I chewed through this clever tale in three days! Not only were the plot and characters charming, but Kristin Tubb provided great facts about children's classics, Dewey Decimal call numbers, the NYPL's history, and some legitimate laugh-out-loud moments. Great for fans of E. L. Konigsburg, Betty MacDonald, and Jeanne Birdsall. Kristin O’Donnell Tubb is an amazing author. I’ve read all of her books and they just keep getting better. The Word Collector is the latest. It’s historical; fiction and I’m amazed at just how much history was contained in this book. An adventure, a mystery, an wonderful book. This review has been hidden because it contains spoilers. To view it, click here. Great read, especial since it was based on a true story. Fantastic and magical middle grade novel that depicts the real family that lived in the NYPL in 1929. Loved everything about it! Kids living in the New York public library during the early 20th century, solving mysteries...I worried this might be checking too many sweet spots for a librarian to wholesomely like. Refreshingly, and accurately the characters reflect the immigrant melting pot of the time, though no sign of contemporary racial prejudices appear. I liked the characters more than I expected to. The mystery is not much of a puzzle, which does rob the book of some punch, but it is enjoyable and should satisfy midd Kids living in the New York public library during the early 20th century, solving mysteries...I worried this might be checking too many sweet spots for a librarian to wholesomely like. So many good quotes in this- and a cute kid adventure story! While I loved the idea of this book (a girl who LIVES in the NYPL! ), I just couldn't get into it. The story seemed a little awkward to me. We don't find out until much later why she's writing to her "friend" and I didn't understand the story collector at first. I wish the story was developed a little better and maybe would have been more about Viviani's life, rather than her trying to trick a new girl. 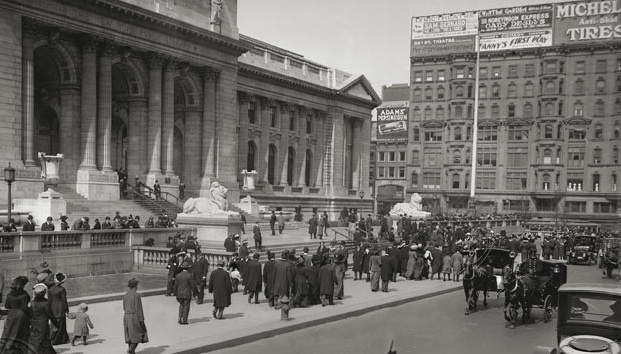 Would you like to grow up living in the massive, beautiful, historical New York Public Library? If you are a book lover you should say yes! What if I told you it was haunted by the ghost of a man named Big Red? This is exactly where eleven-year-old Viviani Fedeler grew up with her two brothers. Viviani is a terrific storyteller and adventurer and somestimes both of these things can get her in trouble. One night when her and her best friend, Eve, sneak into her father's workshop deep in the basement they possibly come face to face with a ghost. This is when her father tells her the story of a man who died while building the library. He was up to a bit of mischief when he fell to his death and now he haunts anyone who is mischievous. Viviani has always captured the attention of her classmates with her storytelling, until one day a new girl comes to join their class. Viviani thinks that she could become a new best friend until Merit calls her a liar for telling her stories, and suddenly the class starts to question Viviani. When Viviani invites her to spend the night in the library so that she can photograph the ghost, things go all wrong and the change of the bff status happeing dwindles. With Viviani down in the dumps at least she has the extremely valuable and rare stamp collection on display that she can go look at, that is until one night when it is stolen. Suddenly her dad's job is in jeopardy which means that her family's home is in jeopardy. Viviani has to somehow prove who stole the stamps but can she do it on her on? Can Viviani and her friends sabotage the thief's plan and save the day? Will the ghost of Big Red scare them off? Read this incredible book to find out what happens to Viviani and her crew. This book was beyond amazing to me. It is every true librarian's dream to live in a library like the New York Public Library. This book is set in the 1900s and brings in so much history. The descriptions of the various rooms in the library is fantastic. The Story Collector by Kristin O'Donnell Tubb, 233 pages. Henry Holt (MacMillan), 2018 $16.99. Language: G (0 swears, 0'f') Mature Content: G; Violence: PG. 11-year-old Viviana Fedeler lives in the New York Public Library! It's 1928 and her father is the library Superintendent, so Viviana and her family live in an apartment in the beautiful building. She is a story teller, and at recess entertains her friends in the school yard, but whe The Story Collector by Kristin O'Donnell Tubb, 233 pages. Henry Holt (MacMillan), 2018 $16.99. Language: G (0 swears, 0'f') Mature Content: G; Violence: PG. 11-year-old Viviana Fedeler lives in the New York Public Library! It's 1928 and her father is the library Superintendent, so Viviana and her family live in an apartment in the beautiful building. She is a story teller, and at recess entertains her friends in the school yard, but when a new girl moves in, she doesn't appreciate the stories and calls Viviana a liar! Viviana wanted to be friends! Oh dear, this is certainly a bad beginning. Tubb has crafted an exciting, mysterious, nostalgic story. Based on the true life experiences of the Fedeler children, the writing and illustrations are vivid, and the time period is well researched. I hope to see further stories featuring her brothers and their friends. Includes an afterward and a time line, plus links to visit the library online to see the rooms for yourself. Exciting and interesting children's book where you step into life within a library, literally. Viviani lives in the local library with her two older brothers and her parents. She learns valuable life lessons not only from her family and friends, but from the ghost of the library, all the while saving the day from the stamp thief. I had a hard time adjusting to the didactic and narrative writing style in the first chapter, but after the first few chapters, I was hooked. I enjoyed the chapter headi Exciting and interesting children's book where you step into life within a library, literally. Viviani lives in the local library with her two older brothers and her parents. She learns valuable life lessons not only from her family and friends, but from the ghost of the library, all the while saving the day from the stamp thief. I had a hard time adjusting to the didactic and narrative writing style in the first chapter, but after the first few chapters, I was hooked. I enjoyed the chapter headings that matched entries in a library catalog. It brought to life how the children live in a library and find adventure there everyday. The vocabulary was also great for helping children grow in their reading ability while still catering to their reading level. I particularly loved how so many things said were profound, and I wanted to write them on my facebook as quotes. I will be looking for this book for my personal and classroom collections. 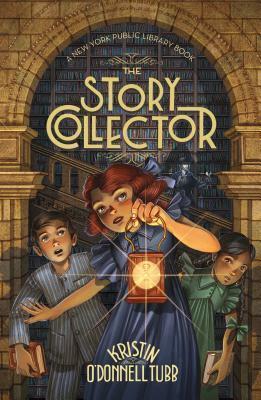 The Story Collector tells the tale of Viviani Fedeler, who was a real person born and raised in the New York Public Library. Viviani lives up to her name—she is vivacious! She looks for ways to entertain herself in the library, often causing mischief. When she meets a new girl who is so interesting it is annoying, and who calls Viviani out on her tall tales, Viviani decides to play a trick on her, with the help of her brother and best friend. She hosts a sleepover at the library with the plan to The Story Collector tells the tale of Viviani Fedeler, who was a real person born and raised in the New York Public Library. Viviani lives up to her name—she is vivacious! She looks for ways to entertain herself in the library, often causing mischief. When she meets a new girl who is so interesting it is annoying, and who calls Viviani out on her tall tales, Viviani decides to play a trick on her, with the help of her brother and best friend. She hosts a sleepover at the library with the plan to scare the girl with a fake ghost. However, some frightening sounds interrupt the ghostly fun, and the next morning, a mystery appears! Someone has stolen the rare postage stamps on display. Viviani must unite with the new girl to find the thief. The first part of the book was a little tough to get in too, but once the mystery began, I was hooked. The possibility of living in a library is automatically appealing, and the characters are fun and lovable. The Story Collector will entertain book-lovers of all ages. Viviani Joffre Fedeler has spend all of her eleven years living in the New York Public Library. In fact, she was born there. Thanks to her father being the building's superintendent, Viv spends her time exploring the rooms, the stacks, and every nook of the library. She considers herself a story collector, so she collects all the stories of the library to recount to all her friends at school. But a new student, Merit, doesn't find Viv's stories to be much fun. She actually considers them to be Viviani Joffre Fedeler has spend all of her eleven years living in the New York Public Library. In fact, she was born there. Thanks to her father being the building's superintendent, Viv spends her time exploring the rooms, the stacks, and every nook of the library. She considers herself a story collector, so she collects all the stories of the library to recount to all her friends at school. But a new student, Merit, doesn't find Viv's stories to be much fun. She actually considers them to be lies! Viviani simply can't understand. She invites Merit to spend the night at the library, so Merit can see the stories aren't lies. But something strange happens during that night, spooking everyone. The next day, an expensive collection goes missing. Viviani, her siblings, and her friends must gather all their wits and courage to get to the bottom of the case. Even though this is a children’s book I figured a mystery story concerning the New York Public Library should be interesting. It takes place during the early 1900s. A family lived in the library since the father was the custodian. His children were quite precocious and played among the stacks night and day. A stamp collection was displayed in the library and was stolen one of the evenings that the children had a sleepover. They decide to try to solve the theft so their father would not lose his Even though this is a children’s book I figured a mystery story concerning the New York Public Library should be interesting. It takes place during the early 1900s. A family lived in the library since the father was the custodian. His children were quite precocious and played among the stacks night and day. A stamp collection was displayed in the library and was stolen one of the evenings that the children had a sleepover. They decide to try to solve the theft so their father would not lose his job.